Taking the metro is an experience that shapes modern ideas about metropolitan living. The arrival of “NAMMA METRO” or “our metro” to the city of Bangalore as a lived experience has opened up a pandora’s box of modernities contradictions. Taking the Bangalore Metro alongside many excited metro travelers, I too was swept by a wave of excitement, a thrill at seeing the city of my youth from angles I never imagined, sudden vistas of neighborhoods I only knew from scurrying along on my bike through windy lanes. The city unfolds as a low lying picture with the dragon tail of a metro line sweeping through formerly sleepy, quaint neighborhoods with beautiful villas and tastefully designed homes, now replaced by commercial high-rises of nondescript architecture. 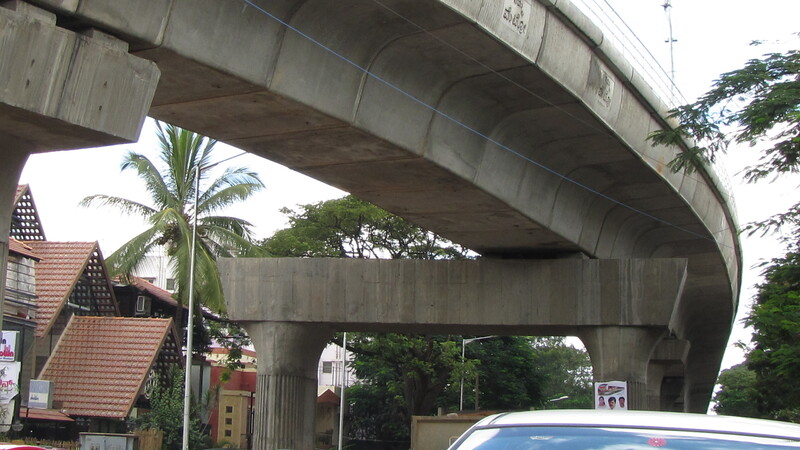 The Bangalore Metro has destroyed the city’s most beautiful avenues, slicing through the city like one of Robert Moses’s Molochian axes. It is a travesty of modernity to see a behemoth rise so cavernous, and heavy set, at the heart of what once was a very walkable core of the city. Now, the grotesque feet of the elevated metro make the pedestrian fearful, nervous, alienated. It is also a symbol of enormous pride, of nationalism, of regional success. Only the pedestrian bemoans the modern monstrosity. The pedestrian must now reinvent the space of the metro as a habitable terrain- reclaim its dead entrails and transform the interstitial gaps between traffic into a livable experience. Until then, one mourns and gasps at the site of the Bangalore Metro, winding through the city’s skyline, like a bad 1970’s nightmare of modernity. There is no where to hide, except under the shadow of the gigantic concrete serpent.